I am back at it again with the goat cheese. I recently read that goat cheese has a large amount of tryptophan in it, the same stuff in turkey that makes everybody so sleepy after Thanksgiving dinner, so if you are having trouble sleeping you might just want to try one of these quesadillas before bed, or maybe the Smashed Potatoes with Goat Cheese & Parsley. Tryptophan is not only good for sleeping, but is an essential amino acid that has been shown to boost your mood and help you relax as well. If that isn’t enough to get you eating goat cheese, maybe this recipe will. I am literally writing this post while eating this quesadilla; it is just that good. The flavors in this recipe are so unique. When I think of olives and roasted red peppers I usually have a distinct flavor in mind, but this dish is nothing like that flavor I know. There is something about the goat’s cheese with the shrimp that completely morphs these flavors. This is one of the most delicious and unique tasting recipes I think I have ever made. 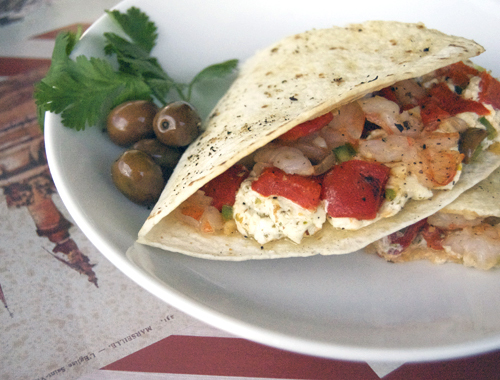 It has a creamy tanginess that comes from the goat cheese, along with a savory blend of shrimp and olives with a little bit of spice from the jalapenos. If you are looking to adventure away from your classic quesadilla, this is the perfect recipe for you. 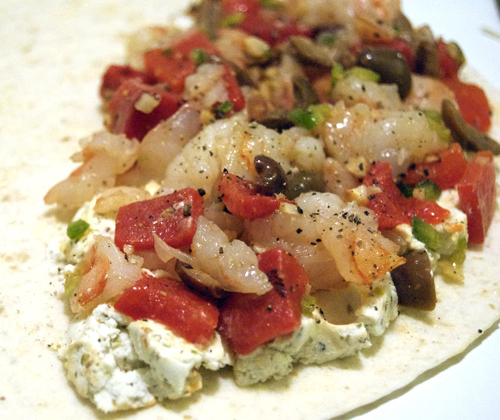 In a medium bowl, mix the shrimp, cheese, red peppers, olives and jalapenos. Lay out each tortilla and spread ¼ of the mixture on only one side of each tortilla. Fold the tortillas over and press gently to even out the filling in each. Place the quesadillas on a baking sheet, brush each with ½ tsp olive oil and sprinkle with black pepper. Bake the quesadillas at 425F until they are golden brown (about 6-8 minutes). Remove from the oven and let each cool for a minute or two before serving. I never knew goat cheese makes you sleep. It certainly does not have that effect on me. I eat of ton of the stuff and I cannot say that I ever get sleepy afterwards. 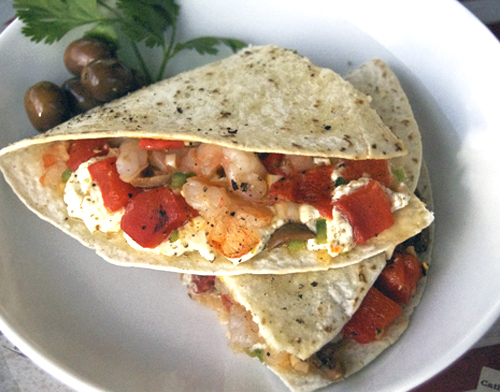 The combo of shrimp and goat cheese sounds delicious in quesadillas. I will have to try this. I love this!!!!!!!! So yummy looking! I stumbled and pinned this one! 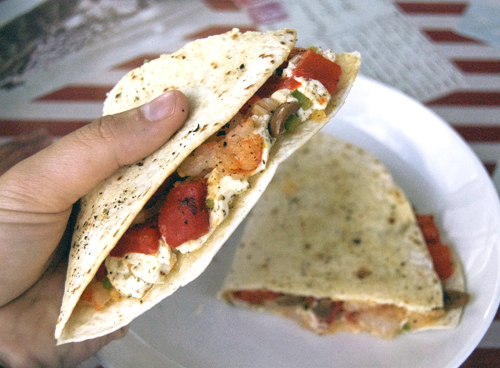 Nothing like taking a regular quesadilla and turning it up like 10 notches! The shrimp filling would be good with salad greens too. I imagine the goat cheese is as tasty as any creamy dressing, as so refreshing too. These quesadilla do look incredibly good. Thanks for the recipe. Wow, these look awesome. I love, love, love goat cheese. I do the same thing sometimes and write the post while I eat because I’m so excited to share it! These do look awesome! I’m definitely going to give them a try!